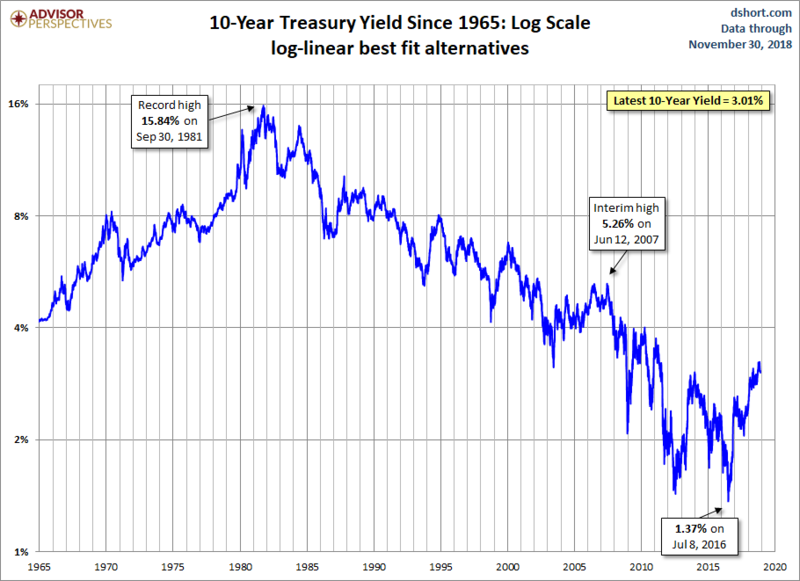 Let's have a look at a long-term perspective on Treasury yields as of the November 30 close. 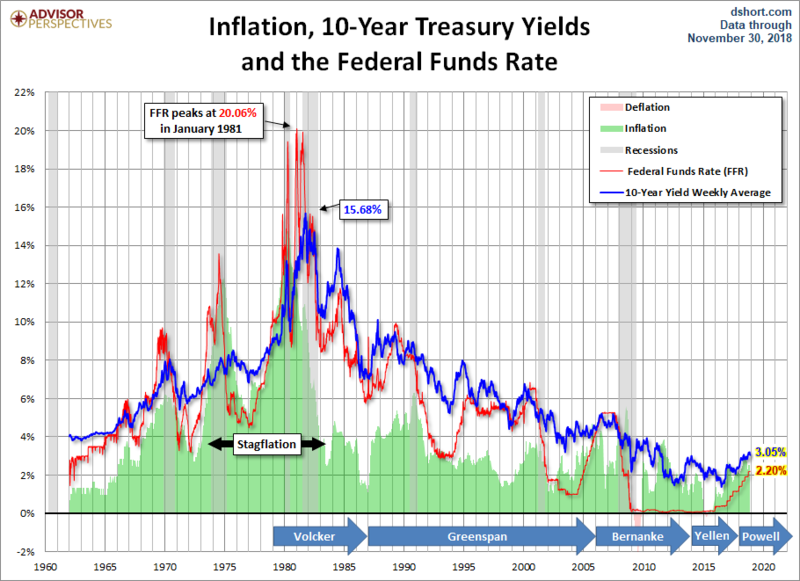 The chart below shows the 10-Year Constant Maturity yield since 1962 along with the Federal Funds Rate (FFR) and inflation. The range has been astonishing. The stagflation that set in after the 1973 Oil Embargo was finally ended after Paul Volcker raised the FFR to 20.06%. The last couple of years have been remarkable ones for yields. The 10-year note hit its historic closing low of 1.37% in July of 2016 and then rose 164 BPs to 3.01% as of the November 30th close. 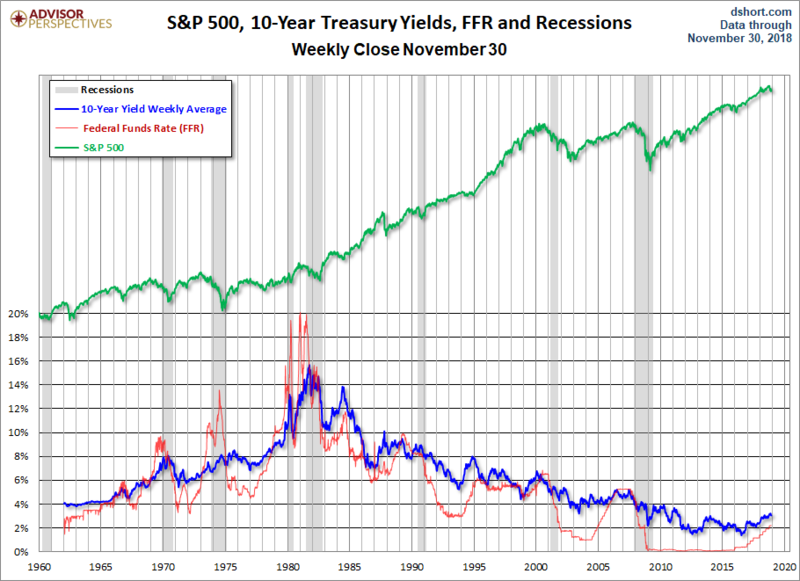 Now let's overlay the S&P 500 to see historical pattern of equities versus treasuries. 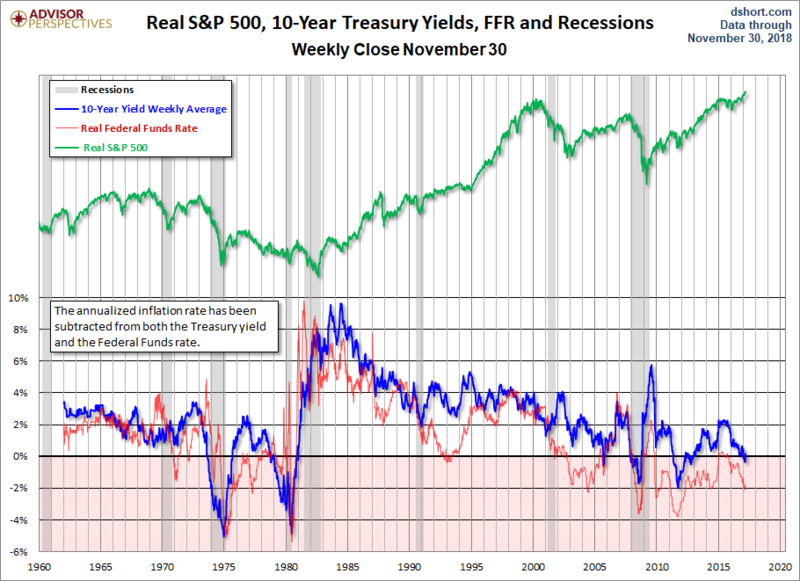 This is a nominal chart, which significantly distorted the real value of both yields and equity prices. Here's the same chart with the S&P 500 and 10-year yields adjusted for inflation using the Consumer Price Index. The impact of stagflation becomes much clearer. We can better understand the severity of the decline in equities from the mid-1960s to the bottom in 1982. And we can also see why high yields can be deceptive in periods of double-digit inflation. The most interesting series in the charts is the FFR red line. We can see how the Fed has used rate to control inflation, accelerate growth and, when needed, apply the brakes. 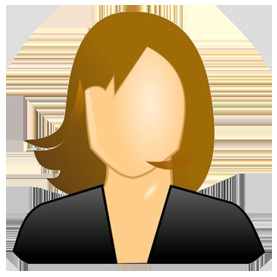 The FFR was virtually zero from 2008 through 2016 and has proven to be a poor tool to stimulate the economy. Incidentally, we've annotated the top chart with the tenures of the last three Fed chairmen so we can see who was managing the various FFR cycles since the summer of 1979. 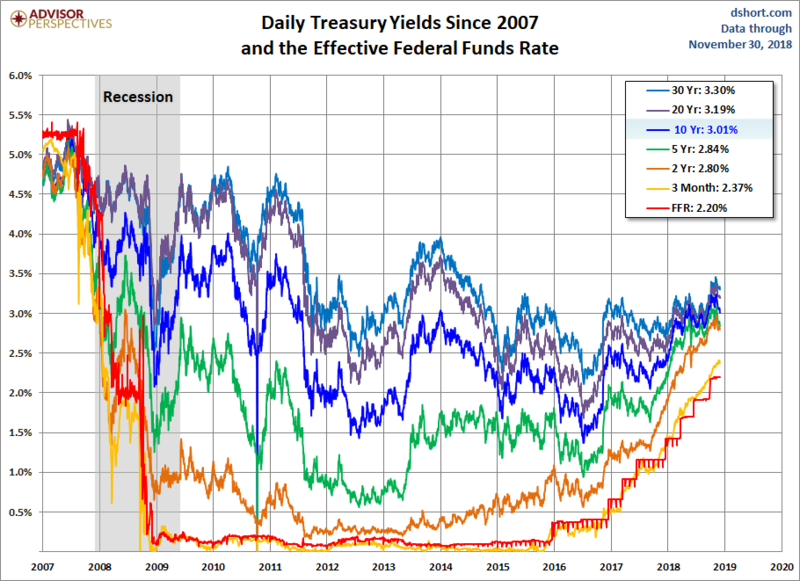 The next chart is based on daily data and adds some additional Treasuries for a close look at yields since 2007. 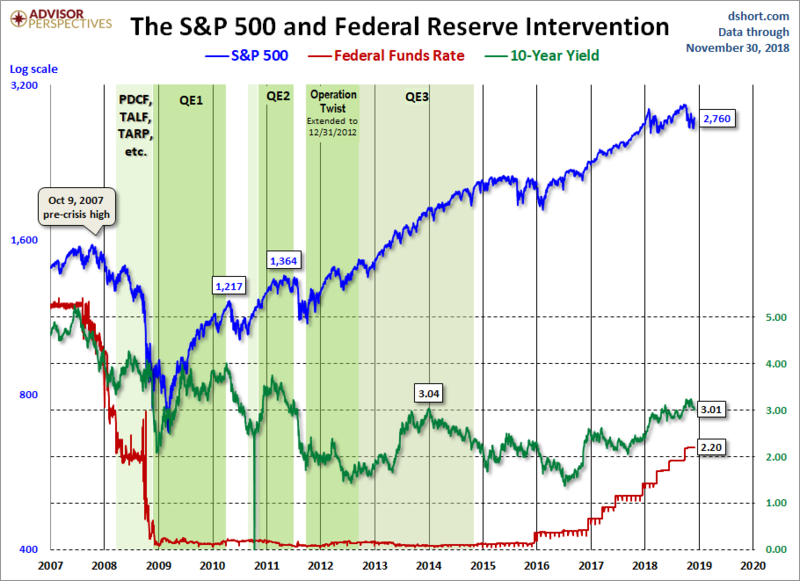 Now let's see the 10-year against the S&P 500 with some notes on Fed intervention. We update the long-term charts periodically and the last chart more frequently, depending on yield volatility.